On July 2 of this year, the cargo ship Anna Desgagnés (picture) delivered a cargo of heavy machinery and trucks to several Atlantic ports. 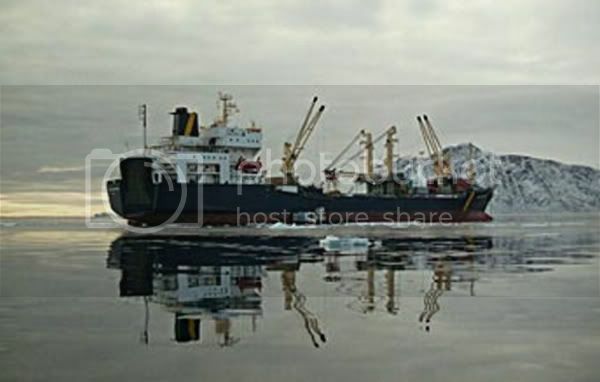 Its final destination was the bay of Resolute, one of Canada's most Northern and coldest harbors. In addition to this routine cargo, the 17,850MT ship carried other loads: a message of innovation, a wake-up call to the shipping industry, and some hundred tonnes of biodiesel. Rothsay Biodiesel, a division of Maple Leaf Inc., supplied the 115,000 litres of biofuel, in the context of the project 'BioShip'. The generator of the Anna Desgagnés ran on B20 fuel (20% bio and 80% petro), during its 38,000 kilometer journey. After reaching its final destination, researchers from Canada's Centre de Technologie Environnementale will measure the exact emission levels of the generator which are then to be compared with results taken earlier when the Anna Desgagnés ran on ordinary bunker fuel. First estimates put the CO2 emission reductions for the ship at 400 tons per year. According to the WGBU's data, the entire world trade fleet in 2001 consisted of approximately 41,000 cargo and passenger vessels (over 300 RT), amongst those are some 10,000 tankers, 6,000 ships for dry bulk articles, 2,600 container ships, 18,000 general cargo and roll-on-roll-off-freighters, 2,500 combined cargo-passenger ships and ferries, as well as 1,500 passenger ships. A recent study from the University of Delaware (USA), the world trade fleet consumes approx. 280 million tons of oil or 2 times more than the entire German economy (approx. 125 million tons). Experts from Lloyd’s Register Quality Assurance (London) estimate that shipping traffic generates 7% of the total worldwide output of sulphur dioxide (SOx), and is thus one of the main causes of climate-damaging gases. A special survey of the WGBU (2002) reaches a similar conclusion: global shipping traffic is responsible for approx. 7% of the CO2 emissions of the traffic sector, or for approx. 2% of global CO2 emissions. Furthermore shipping accounts for approx. 7% of all SO2 and 11-12% of all NOx emissions. Cargo shipping is one of the main causes of climate-damaging emissions and thus contributes substantially to environmental pollution. According to a study from the University of Delaware (11/2003), cargo shipping emits the same amount of nitric oxides as the entire USA. Additionally, according to investigations by the German journal “Bild der Wissenschaft 1/2006”, commercial shipping is the 3rd largest source of climate-effecting toxic substances after industry and road traffic. The biggest environmental problem is that 90% of ship diesels (the standard propulsion for medium to large tankers, bulk barrier and container ships are slowly-operating two-stroke diesel engines) run on a comparatively cheap, but highly contaminated fuel oil. The low-grade fuel oil is a viscous substance, which is a by-product residual at the end of crude oil production. It consists of all the components of crude oil unusable for the production of petrol or diesel fuel. Fuel oil with low sulphur levels (MDO/MGO quality) costs almost twice as much as the IFO 180 and IFO 380 qualities predominantly in use. During the combustion of fuel oil large quantities of toxic substances pass into the air. In comparison to other substances fuel oil has characteristics causing considerable environmental pollution. The combustion of fuel oil mainly produces nitric oxides (NOx). A 90-95% reduction of NOx emissions through, for example, the installation of ship catalysts, requires the investment of approx. 40,000 Euros per Megawatt (MW) installed propulsion power. Additionally, costs for operating supplies and increased fuel consumption have to be covered. Nitric oxides (NOx) react with hydrocarbons (HC) under the influence of sunlight, generating ozone and leading to smog. Sulphur oxides can aggravate respiratory illnesses and are a cause of “acid rain”. Ozone leads to breathing difficulties in humans and damages flora. The Anna Desgagnés and its marine biodiesel does not come too late. In the future, substantial cost pressures will arise for ship owners due to the introduction of emission-dependent charges in cargo shipping. The International Maritime Organisation (IMO), a sub-organisation of the UN, is responsible for ship safety and the prevention of pollution caused by ships at an international level. In order to reduce air pollution caused by ships the IMO enacted laws on 19th May 2005 (MARPOL 73/78, Annex VI) regulating threshold values for the emission of SOx and NOx and controlling the emission of ozone-reducing substances by ships. These laws include the stipulation of a maximum sulphur level of 4.5% in heavy oil internationally, and a maximum sulphur level of 1.5% in ‘SOx Emission Control Areas’. The English Channel is a SOx Emission Control Area, as the Baltic Sea will be from the beginning of 2006, and the North Sea from the beginning of 2007. The regulation stipulates that ships can either be fitted with a flue able to clean waste gases or with an arbitrary technology which reduces SOx emissions. Aware of these measures, the BioShip project has called on a large number of actors in Canada to test the viability of biofuels for the marine industry. Participants in the project are Transports Canada, Environnement Canada, the Centre de Recherche Innovation Maritime, the Groupe Sine Nomine et the company Transport Desgagnés Inc. Most of the funding comes from Environnement Canada. The project follows in the footsteps of two previous projects, called BioMer and BioPêche, which tested marine biodiesel in respectively cruise ships and fishing fleets. BioShip now targets the much larger trade fleet. According to Mme Carole Campeau, spokesperson for Transport Desgagnés, the results so far have been very promising, with the biodiesel showing an increased engine performance in all three of the tested categories of ships. Amongst the main advantages is the fact that no modification of existing bunker fuel based engine systems is required. In fact, the marine biodiesel acts as a lubricant and cleans the system, which is already adapted to the roughness of heavy fuel oil. When it comes to using the biodiesel in the cold areas of northern Canada, there were no problems as long as the biodiesel content of the fuel did not exceed 20%. -it is 10 times less toxic than table salt and as biodegradable as sugar. Therefor it is highly suitable in ecologically fragile marine environments. Project outline: Project BioShip [*.pdf], Groupe Desgagnés.